You can be certain that the lumber from our trees has travelled less than 100 km to be processed and sold on. 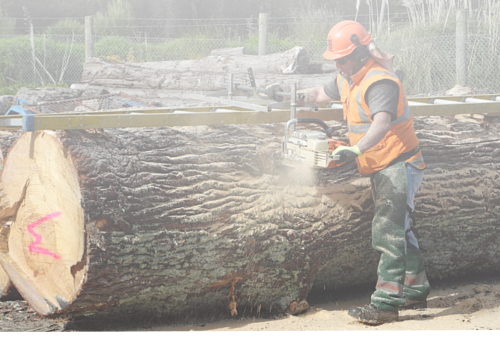 You can be certain that MPI native milling permits have been sourced so that you can buy a completely legal product. You can be certain that we know the history of the tree and the site the tree was removed from. Why this is important to us. Simple - no waste is our goal. Even the sawdust from the milling operation is donated to our local SPCA. Also many people have never seen timber like the slabs and dimensional timber we mill for sale. We take pride in knowing the species and its historical uses. This means we can give great advice for your project. We are chemical free- some of our timbers can be used on or in the ground and will last twice as long as treated pine. Bring your trailer, your ute, your truck, or we can deliver if needed (conditions and costs apply) We are open every Friday from 8 till 2 for viewing other times by negotiation. the milling operation is donated to our local SPCA.